Blanketing an attic. Blown fiberglass is an excellent way to insulate your attic. A shredded fiberglass or cellulose is blown across the attic floor, as the primary insulation or in addition to existing insulation. The heat that rises up through your house and exits through the attic is a major factor in energy loss and heating and cooling expenses. Proper attic insulation is essential and cost-effective. Many attics have insulation already installed. But it was put in incorrectly or without thought to the correct R-value for the space. The R-value on a majority of homes in the country stands at R-19 or lower. The proper R-value for attic insulation in and around Rochester, Ithaca, Syracuse, as recommended by the U.S. Department of Energy, is between R-49 and R-60; quite a distance from the reported average! That's the equivalent of going outdoors in the middle of December without a jacket on...or a shirt! Most attics are already insulated, but if insulation levels are too low, even insulation with a high R-value won't work like it should. If you look across your attic and you can easily see your floor joists, more attic insulation is needed. The professionals at Halco can help you make a decision about the type of insulation to install. Our New York service area includes Ithaca, Rochester, Syracuse and Webster, Fairport, Auburn, Cortland, Canandaigua, Pittsford, as well as surrounding towns. 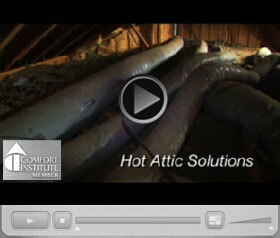 Save up to 20% or more in heating and cooling costs with a properly insulated attic! Seal air leaks to reduce drafts, add more insulation to get a comfortable home year-round, save money and energy with Halco! Schedule a no cost home insulation estimate or comprehensive home energy assessment and start seeing the difference an insulation upgrade can make. First? Air sealing. Next? Insulating the attic. Attic ventilation; a "baffling" concept. Baffles; rigid spacers that fit between attic rafters, provide proper air flow when extra insulation is put into place. Baffles help prevent attic moisture and can put an end to ice damming. Heated or cooled interior air, called "conditioned" air, leaks upward through the dozens of holes that exist in a homes envelope. That conditioned air rises and escapes through the attic. Sealing those openings and halting the escape of conditioned air is an important step in the total insulation procedure. Air sealing can also help prevent attic mold, which is caused by warm conditioned air leaking into the attic. After the air sealing has been completed, insulating can take place. As long as the existing insulation that was re-adjusted is good shape and not damp or compacted, it can be re-installed and improved with the new insulation. Our SuperAttic™ System is designed to both seal and insulate the rafters in your attic with a combination of foam insulation and radiant barrier. Not sure which of our services is right for you? Contact us to meet with one of our home insulation experts who can discuss all the options for upgrading home insulation or other energy-saving improvements like HVAC repair, plumbing, electrical and more. We install insulation for the whole home including the attic, basement, crawl space and more. To Whom It May Concern @Halco. Chris and James showed up right on schedule, after we talked on the phone, and got right to work. They sealed up the crawlspace in quick fashion, that looks very professional. I did not know about the vapor barrier, but James took a moment to explain that. It really looked nice when finished. I'll be proud to show it off when people come to visit. Next came the attic. The attic needed a little more prep work than originally anticipated, but the guys used some foam board, and spray foam, and got the job done. They laid down a nice thick layer of the cellulose very even about 21" deep anticipating it would settle down to 18". Everything was handled very professionally right down to sealing the hatches shut. I would hire them again in an instant. The most impressive praise came from two of my friends; one is a carpenter, and the other is a general contractor. I was a little out of my area of expertise so I asked them to talk to the guys, and look at the work. Both said no question that I had hired a good group of guys, and that everyone was very knowledgeable, and that they could not do a better job themselves. This from 2 guys with almost 80 years combined experience in home building, and remodeling. Sincerely, Hal R.
Quick efficient & skillful. Thank you for an excellent job! Scott was very friendly and professional answered any questions or concerns I had a very pleasant experience. John may be the most thorough technician we've ever had. He was very conscientious. Thanks for sending him. Halco, I would like to thank you for the wonderful job your crews performed while insulating my house in Naples. As a result of the process, my home is much more comfortable this heating season! I have already sent you my thoughts on the men who actually worked on the task of insulating the house. However, I have been remiss in not informing you of the professionalism and expertise demonstrated by Energy Advisor, Greg Hays, and Supervisor, Ron DeRue during the entire process. Both gentlemen are very knowledgeable and were able to answer all of my questions throughout the project. Moreover, they were willing to listen and to incorporate my input into the process. They were very respectful of my home and ensured that all work was performed carefully and properly. When questions or problems arose during the installation, both were able to provide answers and solutions. In one instance, I identified what I thought to be a deficiency with the spray foam installation in the attic and above the garage. After reviewing the work that was performed, they agreed with my findings and made arrangements to have additional spray foam sprayed in. This helped to make the dwelling much more energy efficient. Halco is very fortunate indeed, to have two such highly qualified professionals representing your company. Additionally, on the advice your representatives, I have also signed a contract to have Halco service my propane furnace and water heater making me a platinum customer. Respectfully, William S.
Diligent worker / spent 3 hours making sure all was well. Good communication, courteous, knowledgeable, thorough, honest. Top notch service! Complete clean up afterwords. Steve A. Was very personable and did his work effectively. Call 1-833-844-2622 or e-mail us to set up an appointment for your attic insulation estimate. We serve in and around Syracuse, Ithaca, Rochesteras well as Geneva, Penfield, Brockport, Hilton, Spencerport. Don't forget to ask about our SuperAttic™ System for year-round comfort with all-in-one insulated and air sealed protection.